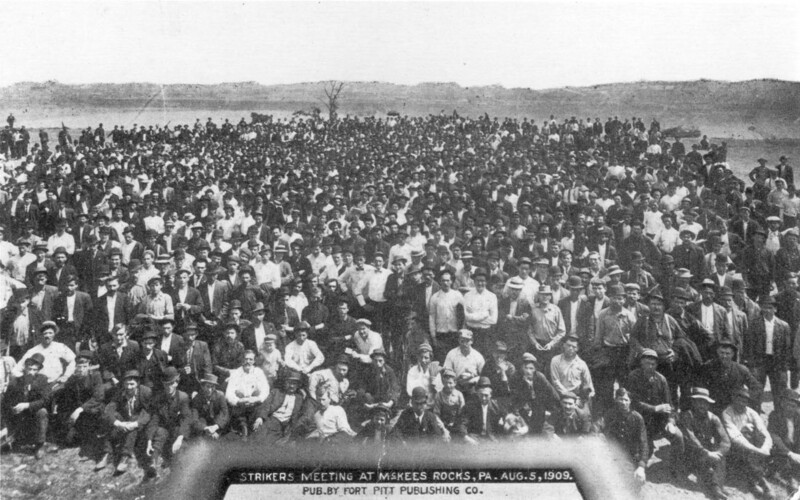 Meeting of striking workers at McKees Rocks, PA, August 5, 1909.
Credit: Library and Archives Division, Historical Society of Western Pennsylvania, Pittsburgh, Pa. In 1909 more than 4,700 workers from a broad range of ethnic backgrounds went out on strike at the Pressed Steel Car Company in McKees Rocks, PA. Like other labor actions during this era, the two-month strike was wracked by violence. A confrontation with the police left twelve dead, many injured, and ended poorly for workers.